It has been a quiet sort of day around here, which gave me the chance to start the next batch of journal pages. Mostly, I've been working on lightning round questions - my absolute favourite thing. I'll post a few tomorrow! Also, I took a quick break to practice, practice, practice my lettering. You do have beautiful writing. I started a art journal where i have been drawing in my hand lettering. i am horrible at it, but practice makes perfect and yours looks amazing. i cant even write mine in a straight line. I recently found your site on Pinterest. I want to thank you for all of the hard work that you've so selflessly put into this. Helping others gain insight into themselves is a powerful gift. I have downloaded and printed all 50 of your free pages, plus I have decided to do one of your day at a glances every day. One thing that I wish you had though were blank lined pages with your beautiful borders so that if I have other thoughts that I want to jot down that I can and still keep it in the spirit of the rest of the journal. Just a suggestion! I love to see your posts and how beautiful your lettering is (and getting better and better with all the practice you are doing). Now I don't want to come across as one of the grammar police here, but I do have a hint for you: What you have been doing is practising; doing some practise, practise, practise. Want to know an easy way to tell when to put in a 'c' and when to put in an 's'? One of those troublesome word sets has a difference in the sound between the verb and the noun. Advice and advise. Just insert the advice/advise word into your sentence and then you know which one of the practice/practise (or licence/license) words you should be using. I was told this a few years ago and it's helped me such a lot! Margot! You are so awesome to mention the grammar issues in this post. I've written a new post - dedicated to you. :) I hope you'll stop by and wade in! 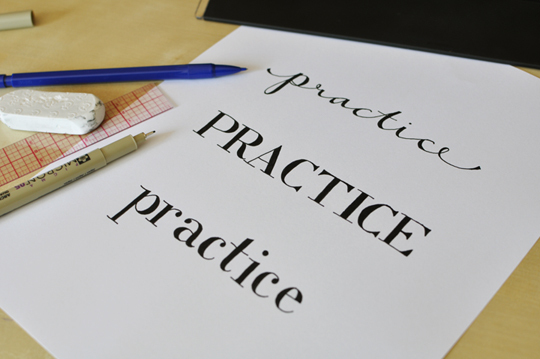 I'm from the U.S. and if I saw "practise" on your blog, I'd think you didn't know how to spell. Seriously. NEVER in my whole life seen it spelled that way here. I'm used to the favour vs favor and other variations of the "our" vs "or" as a lot of Canadians use that (and that's how I know I landed on a "non-US" blog without ever looking at the author's origin! But practise? I bet most your U.S. readers would just think you didn't know how to spell.